Ecological assemblage data includes species composition (abundance or weight of species) at several sites. We would like to know diversity or similarity of assemblages. Several environmental factors are also measured at each site, to investigate relashionships with the assemblage. Multivariate techniques have been developed to analyze these data matrices. In the web pages below, practical methods for multivariate assemblage analyses are explained with examples of R-codes. Renyi's diversity plofile shows a series of diversity indices. Diversity indices are interpolated or extrapolated over sample sizes. Ordination plots of assemblages are constructed by nMDS and PCoA. Effects of environmental factors on assemblages are analyzed by dbRDA. 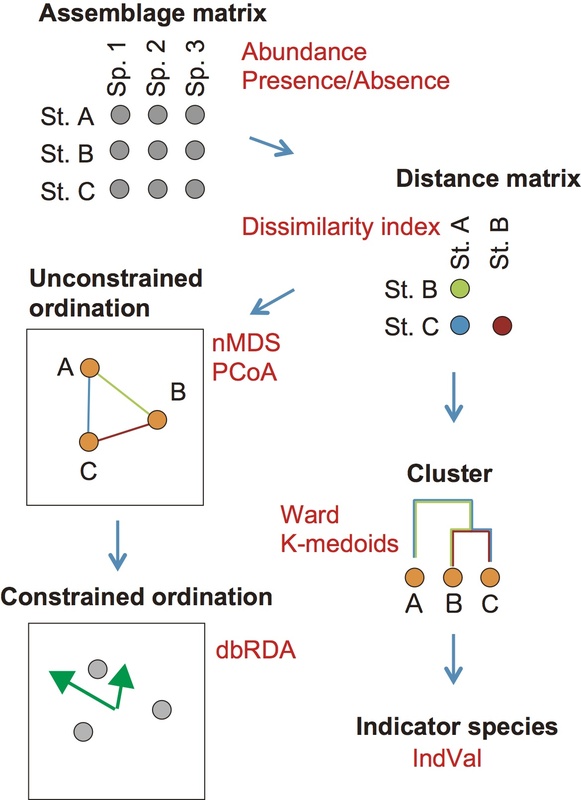 Assemblages are categorized by hierarchical or non-hierarchical clusters. Indicator species of these clusters are determined by IndVal. Download sample data files below. This page is a part of activities of "A feasibility study on biodiversity assessment methods in fishing ground environment" supported by the Fisheries Research Agency, Japan.